Every year, disasters impact human lives and take a significant economic toll. Science plays a key role in reducing disaster risk and mitigating impact. The importance of disaster science is reflected in the Sendai Framework for Disaster Risk Reduction, which links research to key priorities, including understanding disaster causes, investing in resilience, and strengthening governance. In this report, we examine the link between man-made and natural disasters on the one hand, and disaster science scholarly output on the other. We uncover the focus areas of disaster science and zoom in on the most prominent countries involved in disaster science research. 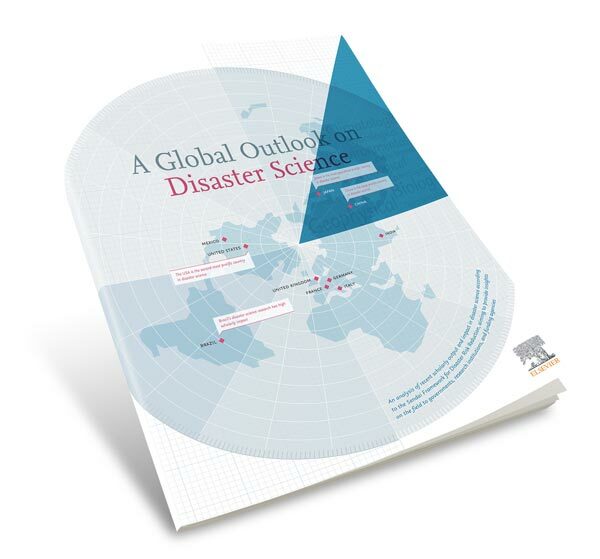 For this report, A Global Outlook on Disaster Science, Elsevier has partnered with leading international institutions1 and drew upon high-quality global data including Scopus to examine the state of worldwide disaster science research. With this report, we wish to describe the field of disaster science and contribute to evidence-based disaster risk reduction policy development and implementation in support to governments, research institutions and funding agencies. This report is part of Elsevier’s continued commitment to support the UN SDGs, and follows our reports Sustainability in the Global Research Landscape and Gender in the Global Research Landscape, as well as our engagement of the RELX Group SDG Resource Center. The report displays an analysis of global disaster science scholarly output and specific topics being studied within research on different types of disasters. One of the most novel analyses presented in the report is the examination of disaster science in the context of the human toll and economic burden of natural disasters. The study also provides more insights on disaster science research conducted in 10 individual countries, in the Americas, Asia, and Europe, revealing which disaster types are researched and where.